Tel Aviv University (TAU, אוניברסיטת תל־אביב, את"א) is Israel's largest on-site university, located in Tel Aviv. As of 2006, the Tel Aviv University has a student population of 29,000. Located in Israel's cultural, financial and industrial heartland, Tel Aviv University is the largest university in Israel and the biggest Jewish university in the world. It is a major center of teaching and research, comprising nine faculties, 106 departments, and 90 research institutes. Its origins go back to 1956, when three small education units - The Tel Aviv School of Law and Economics, an Institute of Natural Sciences, and an Institute of Jewish Studies - joined together to form the University of Tel Aviv. 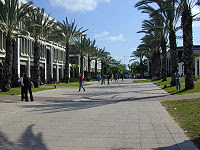 At first attached to the Tel Aviv municipality, the University was granted autonomy in 1963, and its campus in the residential section of Ramat Aviv was established the same year. Tel Aviv University offers an extensive range of study programs in the arts and sciences, within its Faculties of Engineering, Exact Sciences, Life Sciences, Medicine, Humanities, Law, Social Sciences, Arts and Management. The original 170-acre campus has been expanded to include an additional 50-acre tract, now being developed. 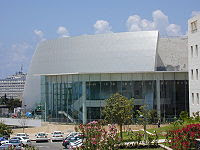 The University also maintains academic supervision over the Center for Technological Design in Holon, the New Academic College of Tel Aviv-Yaffo, and the Tel Aviv Engineering College. 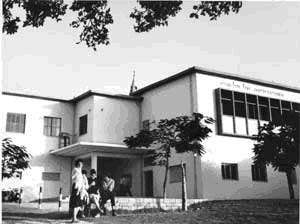 TAU received its autonomy from the Tel Aviv municipality in 1963, when its campus, in the northern Tel Aviv neighborhood of Ramat Aviv was established. Buildings on the Ramat Aviv campus include the Katz Faculty of the Arts, the David Azrieli School of Architecture, the Buchmann-Mehta School of Music, the Fleischman Faculty of Engineering, the Sackler Faculty of Exact Sciences, the Entin Faculty of Humanities, the Buchmann Faculty of Law, the Wise Faculty of Life Sciences, the Faculty of Management--Recanati Graduate School of Business Administration, the Sackler Faculty of Medicine and the Gordon Faculty of Social Sciences. 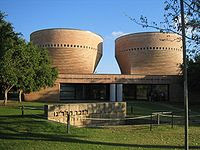 Tel Aviv University offers special programs of Jewish studies to teachers and students from the United States, France, Brazil, Argentina and Mexico. The programs are in English. The School for Overseas Students gives young people from different countries the opportunity to study at Tel Aviv University. The program is in English and also offers the opportunity to live and study in a kibbutz. The Tel Aviv University Law Faculty currently has exchange programs from thirteen overseas universities. Namely: Michigan, Northwestern, Penn, Virginia, Cornell, Boston University, Temple, Cardozo, Toronto, Bucerius (Hamburg), Monash (Melbourne), Milan, and Seoul National University . The university offers about 20 courses a year in English, recruiting many top lecturers from overseas to teach. In May 2007, New York University and Tel Aviv University approved a plan to establish an NYU Study Abroad Campus in Israel based at Tel Aviv University.